Doyle Brunson has been called the “Babe Ruth of Poker,” and that is a fair comparison. Very few people ever live up to their reputation, but Doyle Brunson is one of the rare exceptions. He is the most famous poker player in the world and for the last six decades, Doyle Brunson has been one of the toughest men to beat at the poker table. He is a two-time World Series of Poker champion and a true legend. He wrote the most sought after poker book, Super System. He once won a $1 million bet by losing 100 pounds. He also faked a heart attack to thwart two men who tried to rob his home. Doyle Brunson was born in Longworth, Texas during the Depression. Known as one of the best athletes in the state of Texas, Doyle ran track and excelled in the one mile. He was heavily recruited to play basketball in college and the Minneapolis Lakers showed a deep interest in him. Unfortunately, Doyle’s promising athletic career came to an end after a nasty knee injury. While studying for his master’s degree, he played poker. That seemed to fill the competitive void in his life. When he entered the real world, he soon discovered that he could make more money playing poker than working a nine to five job. He once said that his greatest accomplishment in poker occurred when he was still a student, when he won $37,000 off a rich Texas oilman. He hasn’t looked back since then. Doyle was the first generation of “rounders.” He played in underground cash games all over Texas in the 1950s. The games were dangerous. The majority of the other players were gangsters, pimps, thieves, and other seedy criminals. Gambling and poker were illegal at the time, so there was constant fear of the police breaking up games and hauling everyone off to prison. Winning players were often robbed after the games, and their safety was in constant jeopardy. During the time of those backroom games in Texas, Doyle met Sailor Roberts and Amarillo Slim. He became partners with Slim and they started and ran a book making operation together. Now in his seventies, Doyle Brunson recently showed that he is still a top-tiered professional player. He came in 53rd place at the 2004 World Series of Poker out of a field of over 2200 players. He won the WPT Legends of Poker at the Bicycle Casino in Los Angeles and took home over $1 million in prize money at the largest event in the history of the World Poker Tour. He also made the final table at the first World Poker Tour Championship. Doyle Brunson owns nine World Series of Poker bracelets and is currently tied with Johnny Chan and Phil Hellmuth for most WSoP wins. He has won bracelets in a variety of events including H.O.R.S.E, No Limit, Seven-card Stud, Deuce to Seven Draw, Seven-card Stud Hi/Lo, and Mixed Doubles. 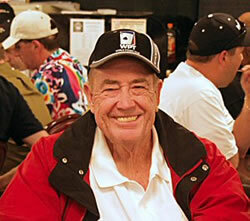 Doyle Brunson has won the main event twice, in 1976 and 1977. He is also a member of the Poker Hall of Fame. Doyle Brunson even has a poker hand named after him. The 10-2 is known in poker circles as the “Doyle Brunson” because he coincidently won both his World Series of Poker championships with that exact hand. His nickname is “Texas Dolly” after Jimmy the Greek incorrectly misread his name. In Super System: A Course on Power Poker, Doyle gathered together the best minds in poker and they shared their tips on beating Texas Hold’em, Seven-card Stud, Low Ball, and almost every other type of variation of poker. The section on No Limit Hold’em outlines his aggressive-attacking style that won him back-to-back World Championships. Super System is often referred to as the poker player’s Bible. Since everyone knew how he played after reading his book, Brunson had to change his style of play. In 2004, he penned the most anticipated poker book in history with Super System 2. Doyle’s son Todd, also a professional player, is a contributing author to Super System 2 along with many of the top pros in the game today. Doyle lives in Las Vegas with his wife, Louise. Doyle plays in the largest cash games in the world with Chip Reese, Johnny Chan, and Phil Ivey. He can often be found playing at the Bellagio.